Hinduism, Buddhism, Christianity, Islam, Sikhism, Bahá’í, and now Mindfulness. The most commonly used term for prayer beads, at least when it comes to mindfulness and the recent meditation revival, is “mala beads”. This is a Buddhist term, but has also been adopted by all types of regular meditators (just like you and me) as a common name for an often used tool. While prayer beads are often used to count and keep track of prayers, they can also be used in meditation to keep track of our mantras. If you’re not sure what a mantra is, here is a quick description below, and you can also read more about it in our guide “How To Meditate In 3 Simple Ways”. Using a mantra is a great way to meditate, as it tasks our mind with focusing on one particular thing – a mantra. And by focusing on a single thing while meditating, we find that it’s easier to avoid being distracted by thoughts and other stimuli. If your mind wanders and gets distracted, just acknowledge the distraction and try to put your focus back on the mantra. Of course it’s not an “easy shortcut” to meditation mastery, but it is generally easier to sit down and repeat a mantra (a word/sound/statement/slogan) than to simply sit down and try to quiet your mind. 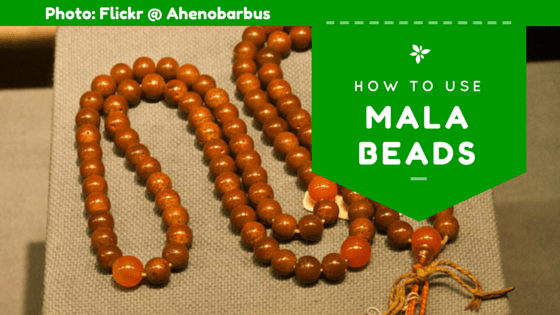 Instructions vary on how to use a mala bead, but here are some general guidelines. If you prefer to learn how a particular Buddhist tradition (or any other religion for that matter) uses prayer beads, I suggest you do a google search to find out. Grab your mala beads. If you don’t have one yet, you can make or buy one. They traditionally have either 108, 27 or 21 beads, plus an additional middle bead which hangs perpendicular to the others (called the “guru bead”). Sit down, or take a slow walk with the beads in hand. Hold the mala beads in your preferred hand, and place it either on your middle or ring finger. Touch the first bead with your thumb, which will also do the job of “rotating” the beads by going from the current bead to the next. When you get to the middle bead (called the “Guru bead”), switch direction. This is of course just a suggestion for how to use the mala beads, and you are free to adapt as you see fit. You should dedicate your meditation session to a specific intention, mantra or affirmation. Having something to touch adds a kinesthetic (touch and feel) element to the meditation, and can help improve the effect. If you’d like to see a demonstration of how to use the mala beads, here is a great YouTube video which covers mala beads in depth. I really enjoyed it, and hope you will too. After learning how to meditate with mala beads, what do you think about this meditation tool? Will you start using it?